Pangrattato are breadcrumbs, which, fried in flavoured oil, make a delicious alternative to Parmesan when sprinkled over risotto or pasta. You could use any wilted leaf here in place of the spinach: try watercress or rocket, or cavolo nero in winter (you'll need to cook this first). Make the pangrattato: heat the oil in a frying pan over a low heat. Add the garlic and cook gently for 1 minute. Add the breadcrumbs and lemon zest and fry gently, stirring, for about 5 minutes, or until golden. Set aside. Wilt the spinach and mint by pouring a kettle of boiling water over them in a colander. Leave to drain. Melt half the butter in a large saucepan over a medium heat. Add the onion, season, and sauté for 5 minutes, then add the fennel. Sauté for 10 minutes until soft. Meanwhile, put the stock in a pan and keep hot over a very low heat. Stir the rice into the fennel. Add the wine and cook, stirring, until it is absorbed. Add a ladleful of stock and, stirring occasionally, cook until it is absorbed. Repeat until you've used all the stock and the rice is tender (about 18 minutes). Squeeze out all the water from the spinach and mint. Chop coarsely and stir into the risotto. As soon as the spinach is heated through, off the heat, dot the remaining butter over the risotto, cover and leave for 2 minutes. Stir the butter in and serve, scattered with pangrattato. 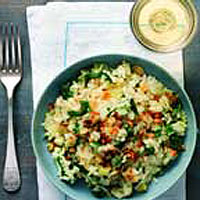 This recipe was first published in April 2005.